Simple to use, yet sophisticated in performance, AIMCO’s cordless tools offer the high performance required to meet the needs of your cordless tool applications. AIMCO’s cordless tools provide repeatable torque performance. Their ergonomic design provides optimal balance and comfort to the operator. Proven battery technologies, and high-efficiency tool motors, offer increased battery life. Use cordless tools when compressed air or electricity is unavailable or impractical. Gain greater access in tight spaces. Eliminate the need to drag tool cords or hoses around; achieve greater mobility with cordless tools. 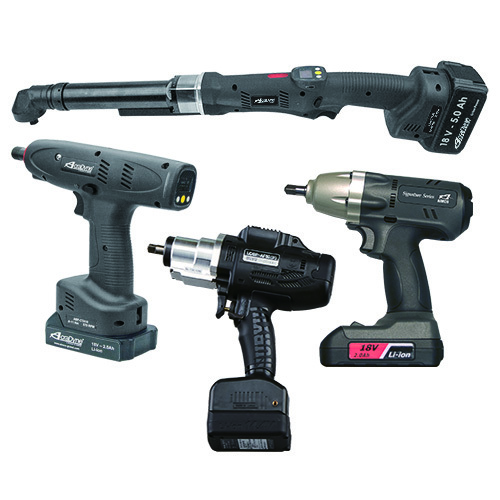 AIMCO cordless tools - when PRODUCTIVITY, ERGONOMICS, RELIABILITY and QUALITY matter.